The FBI indicates that a home burglary happens every 16 seconds — and more than 90 percent of the time, the homes are empty. So, who are these burglars? There are two types: amateur crooks who might kick doors until one gives way, and skilled pros who . The right security measures can discourage expert thieves and beat opportunists. But delinquents aren’t your only problem when it comes to safeguarding your home. You, your friends and your family can get hurt by hazardous areas around your property. Check out these 10 simple things you can do to make your home safer for years to come. If you’re contemplating getting a burglar alarm, join the ranks! 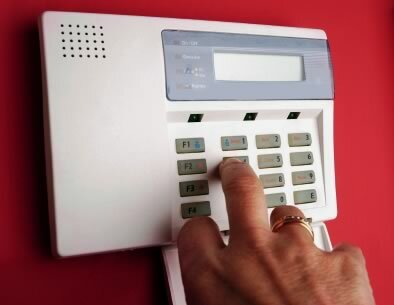 About 1.8 million electronic security systems are installed in homes throughout the United States every year. Understandably so — a house without a security system is three times more likely to be broken into than a residence with one, according to Simon Hakim, a professor of economics at Temple University in Philadelphia. On average, you’ll pay between $125 and $1,500 for a security system, plus a monthly monitoring fee of about $39. There are many good options. Search for a system with a separate control panel and key pad. Those that have both of these in the same unit can be easier for an intruder to defeat before the alarm notifies a monitoring center. Intruders are usually after items they can sell quickly for cash, like jewelry or handguns. Keep these articles out of sight! But not all dogs are equal when it comes to keeping your property and family safe. Guard dogs protect and defend property. They’re not pets. Protection dogs, on the other hand, are family dogs that watch over people rather than a physical area. German shepherds, rottweilers and Doberman pinschers are considered the best breeds for home protection, thanks to generations of breeding. They are friendly with families and kids. If you want a security-trained dog, make sure to buy one from a respected trainer. And if you want a dog and security system, look into pet-immune motion detectors that will announce intruders rather than your furry friend! Make it harder for theives to break into your house at night undiscovered with strategic lighting. Outdoor motion detectors, flood lights and security lighting near possible points of entry, like windows and doors, can be a useful deterrent for unwanted visitors. For an additional layer of protection, consider installing a security camera. Put up signs that indicate that your home is guarded with a security camera to keep potential intruders at bay. Because your home is more likely to be broken into when you’re away, set indoor lights on a timer to make it look like you’re home. More than one lock on a door can make it tougher for theives to get in. Whether you have a lock set, dead bolt or security chain, it’s even more important to be mindful of who has access to your keys and house. Instead of giving your babysitter and dog walker all of your house keys, give them one key to the front door or the garage door opener. That way, if the babysitter’s key is lost or falls into the wrong hands, a intruder won’t have access to the other locks on the front door or any other doors. The same goes for giving out keys to the valet attendant and car mechanic. With a little foresight, it can be easy to minimize risk. Installing modern secure door locks is another deterrent to break-ins. Knowing your neighbors is a cheap form of home security. Well-acquainted neighbors will call you or the police when they see something fishy. If they know you’re out of town, for example, and they see a furniture delivery truck parked in your driveway, hopefully they’ll call in the suspicious behavior. Piled up newspapers on your driveway, promotional fliers left on your front door or even packages sitting on your terrace are all signs you’re away from home. Ask a neighbor to pick up these things so that anyone watching the neighborhood doesn’t get tipped off that you’re out of town. To bolster locks, replace the strike, a metal plate mounted on the door jamb that the lock bolt slides into. For about $10, you can significantly strengthen the weakest of locks. Another way to improve your door’s kick-in resistance is to replace short mounting screws with 3-inch ones that reach the door’s studs. But theives don’t always break their way in. Sometimes, homeowners let them in through the front door! Installing — and persistantly using — a peephole is an advisable way to avoid this dangerous mistake. Windows pose a unmatched security test. All a thief has to do is break a window, reach inside, and unlock it to gain entry. There are some easy things you can do to fortify your windows, starting with the glass itself. Regular glass is really easy to break. Laminated windows are ideal, or a special kind of glass that’s similar to car windshields. Installing a second layer of glass helps, as well as ensuring that panes are securely attached to the window frame. You wouldn’t put candy in front of a child and say “Don’t eat this!” So, don’t keep your blinds open and lights on at night and tempt burglars who might be scouting out your neighborhood. Remember, you’re shrouding the things in your residence as well as the people. This way, it’s harder for potential intruders to learn your routine and to know exactly when your family is at home. Of course, keep high-target items like flat screen TVs and jewelry out of sight. Simple solutions like tall fencing or bushes encompassing your property can help hide views of your home’s interior. Sure, there are things you can do to keep out prowlers, but it’s also urgent to safeguard your house from accident-prone family and friends. s keep out curious young neighbors. Boost safety by setting pool rules like no swimming alone. Also, make sure everyone in your family knows how to swim. The garage is a potentially dangerous area, too. Sharp tools, toxic cleaners and fertilizers should be secured. It’s a good idea to just keep the garage shut and off-limits when possible. Explain to your kids that it’s not a play area, and suggest another place to hang out. Don’t make that error again! Approximately 3,000 people die in residential fires every year, but there are simple things you can do to safeguard your home and family from runaway fires. Keep all of your smoke detectors in good working order. Test them once a month, and replace batteries semi-annually. There should be at least one smoke detector on every level of your home. Maintain a fire extinguisher handy in high-risk areas, like the kitchen and the garage. And above all, participate in a fire escape plan as a family so everyone knows what to do in an emergency.